Now, as it was in 1894 when this manual was written, it is hard to find good help! When you finally do find that right girl to serve you your meals, you may need some help in instructing them of their duties. 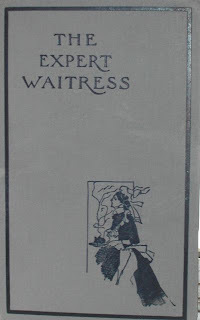 The Expert Waitress by Anne Frances Springsteed is a manual designed to fill that void. Here is one of Mrs. Springsteed’s “useful suggestions” for instructing the help. …cleanliness means more than a clean gown and clean collar and cuffs. One of the first things for a waitress to consider is her supply of underclothing. She will see the necessity of fresh print dresses for morning work, and a neat dark costume for afternoons; but she may be thoughtless at first about underclothing. Yet to keep clean, and by keeping clean to promote good health, nothing is more important than to be able to change underclothing whenever she feels the need to do so. This piece of useful advice comes AFTER our waitress has been taught to bring breakfast, lunch, dinner, supper, afternoon tea and a traveling lunch. It comes AFTER our waitress has been instructed to care for the dining room and pantry; to wash dishes, polish silver, change the oil lamps, and care for the carvers. Oh yes, now might just be a good time to change your underwear! Right before she is instructed to care for an invalid’s room. Well, better late than never. In these times of financial uncertainty, when the average investment banker/stock broker is asking, "Do you want fries with that shake? ", it behooves us girls to be prepared for the inevitable career shift. Forget about that master's degree, forget that consulting stint, remember to tell your future employer you understand that you are to serve from the left and oh yeah, you frequently change your underwear.